Did you know that November 15th is America Recycles Day – a national initiative to keep America beautiful? Our library is proud to do its part and you can too by recycling paper, plastic, cardboard, glass, foil and metal. 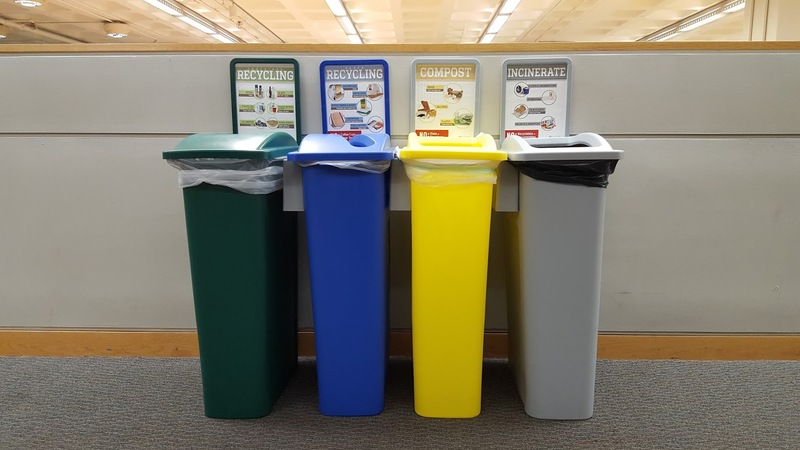 Just drop your clean recyclables into one of the bins throughout the library; these are located near the exits in Brody Learning Commons (BLC) and Milton S. Eisenhower Library (MSEL) and near stairwells. 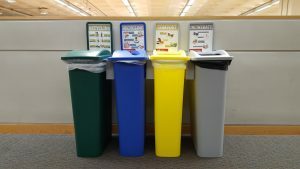 Paper and cardboard go into blue bins, while all other recyclables go in green bins. Have your batteries run out of juice? 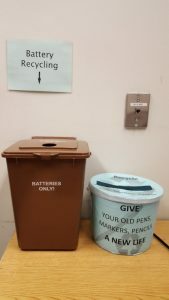 Recycle them in the MSEL copy/print room on M-level! Have your pens, pencils or markers stopped doing their job? Drop them off in the copy/print rooms of either MSEL on M-Level or BLC on B-level! If you’re curious as to what else can be recycled, stop by Levering Courtyard between 11:00am-1:30pm on November 15th and chat with Homewood Recycling. They’ll tell you why and how your recyclables make a difference, and how you can close the recycling loop. You can also drop off your clean, empty containers of personal care and beauty items (such as shampoo, conditioner, and gel bottles), dental hygiene items (such as toothbrushes, toothpaste, and floss containers), and protein/granola bar wrappers. These can be up-cycled into something awesome! Win-win! Homewood Recycling will also be raffling off items from Terracycle, a company that recycles hard-to-recycle items, from chewed up bubble gum to hairballs (no kidding!) 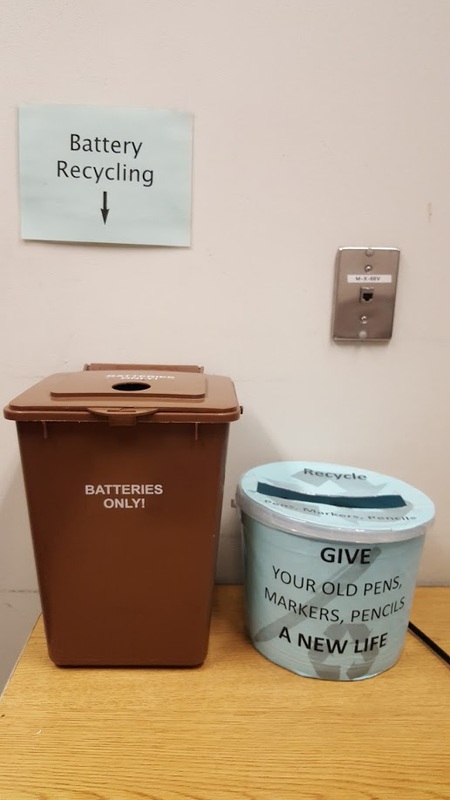 — even those pens, pencils, markers and batteries you drop into our collection bins. This week, “like” Homewood Recycling‘s Facebook page to enter their raffle for a chance to win one of 10 prizes. If you’ve already “liked” their Facebook page, you can share their America Recycles Day posts and tag a JHU friend to be entered. The contest will run from November 13th through November 17th. Good luck and thanks for helping us make a difference! Really an impressive matter that America has the day of recycles which celebrate on 15th November. It’s really a national initiative to keep America beautiful. All the country have to keep this type of day for people awareness.